After 2000 build hours over a period of 2 years December 3rd saw the launch of my completed Monaco. A very memorable day. With thanks to Glen-l for a terrific set of plans, to previous Monaco and Riviera builders who generiously posted their build photos providing a wealth of information for first time builders like myself and to fellow Aussie builders for valuable advice and support along the way. The build has been an extrordinary experience. Jane and I are now enjoying this very beautiful boat. Last edited by Tim Major on Wed Dec 21, 2011 4:29 am, edited 1 time in total. The Bitterness of Poor Quality, Remains Long After The Sweetness of Cut Price is Forgotten...Thanks Dad R.I.P. She looks great well done. I'm sure there is still a big grin on your face! When we flew our RVs (Van's Aircraft) for the first time we all had what we called the RV Grin which was pretty much permanent. I think we all have that Glen L Grin when we launch our boats for the first time. Yea!!! Looks beautiful....now a performance report!!! Yeaaaaaah Tim! Congratulations on one heck of a beautiful boat. You have much to be proud of! Thank you for sharing the photos--we look forward to many more! Stunning boat, looks like it drew lots of attention. More pics please! Beautiful job! Can you post any video (I know, I am greedy) but thats a beautiful boat! Not only a beautiful boat and a wonderful achievement, but also a fantastic encouragement to all builders. Be proud Tim; a great job. Location: Sunshine Coast, Queensland, Australia. Building Gentry. You must be very proud! Stunning boat and great to see an Aussie launch. Beautiful weather for it. 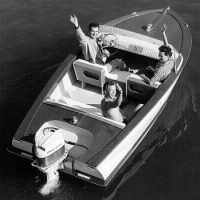 Few things in the world measure up to the thrill and satisfaction of boating in a boat that you built.